What are in 4Videosoft DVD to iPhone Suite? Bundled with two best iPhone Converter: DVD to iPhone Converter + iPhone Movie Converter, 4Videosoft DVD to iPhone Suite is able to rip DVD to iPhone and convert video to iPhone. That’s to say, you can convert DVD to iPhone, iPhone 3G MP4, H.264 (.mp4), MOV videos and MP3, AAC, WAV, M4A, AIFF audios. You are also access to input MPG, MPEG, MPEG2, MTS, M2TS, TS, VOB, MP4, M4V, RM, RMVB, WMV, ASF, etc and convert them to iPhone video and audio. 4Videosoft DVD to iPhone Suite provides more editing functions to enhance your output quality, such as trim, crop, merge, effect, take snapshot, etc. 4Videosoft DVD to iPhone Suite reference? 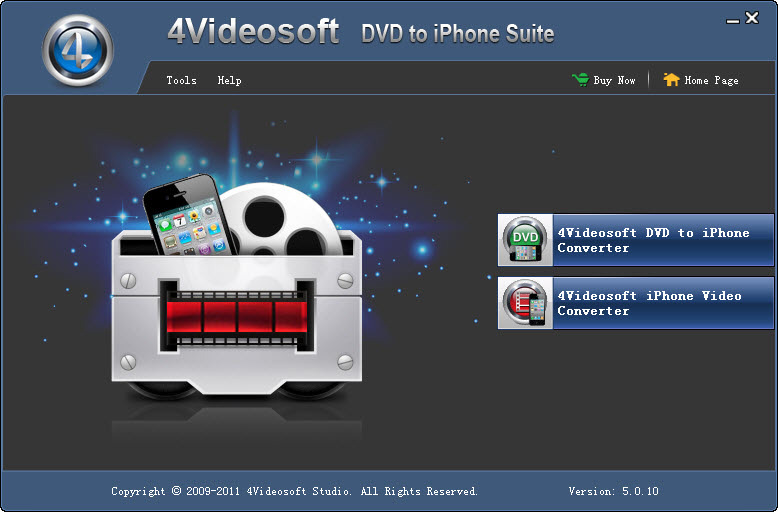 What 4Videosoft DVD to iPhone Suite can do for you? Convert DVD to iPhone MP4, H.264 (.mp4), MOV videos and MP3, AAC, M4A, AIFF, WAV audios. Convert video to iPhone, including converting MPG, MPEG, MPEG2, MTS, M2TS, TS, VOB, MP4, M4V, RM, RMVB, WMV, ASF, etc to iPhone. You are also allowed to get iPhone compatible audio formats by inputting popular audios. Modify video Brightness, Contrast, Saturation and volume. Get any part from the source video by filling concrete start and end time. Use Crop function to get rid of the black edges to achieve the best watching effect. Combine several interesting files into one with the help of 4Videosoft DVD to iPhone Suite. Adjust the DVD movie and video Encoder, Resolution, Frame Rate, Bitrate, Sample Rate, Channels. In addition, you can input your own-set Resolution. Click Save as… to reserve well-customized parameters as your own profile. For interlaced DVD movie and video, check Deinterlacing to avoid mosaic and get the progressive video. 4Videosoft DVD to iPhone Suite assists you to capture your favorite pictures and select DVD audio track and subtitle based on your needs. You can preview both your source and output file effect at the same time. With super fast conversion speed and high quality, 4Easysoft Mac AVC Converter brings you the most convenient and enjoyable conversion process.